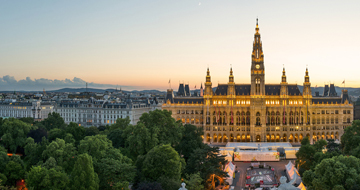 Vienna owes its appeal as a tourist destination to an exciting blend of nostalgic flair for the imperial era coupled with a highly creative cultural scene which offers up the latest trends while carefully maintaining a precious cultural heritage and well-loved traditions. The architecture from the period of the Danube Monarchy shapes the city’s imposing appearance. Splendid edifices from the Baroque, Historicism (‘Ring Road style’) and Art Nouveau periods as well as the city’s spacious overall layout belie the fact that this is the capital city of the Republic of Austria with its population of just 8.4 million citizens, whisking visitors away to a romantic imperial city. 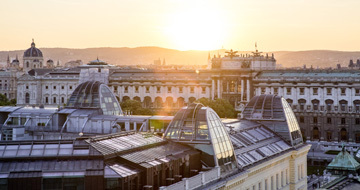 It’s not just the many buildings from the imperial period that make Vienna a city steeped in art and beauty: world-class museums, collections and works of art can be seen here. Among others, these include the Kunsthistorische Museum, the Belvedere, the Albertina and the Leopold Museum in the Museum Quarter. And sights such as St. Stephen’s Cathedral, the Hofburg and Schönbrunn Palace invite visitors to get out and explore the city. 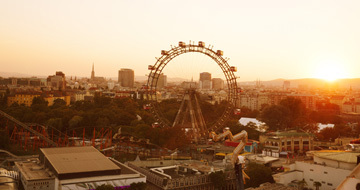 Vienna also enjoys an international reputation as the City of Music. More world-class musicians have lived here than anywhere else in the world. In addition to those who were born here, including Schubert, Strauss and Schönberg, Vienna was also the adopted home of Mozart, Beethoven and Brahms. A walk through Vienna could be compared to a trip back in time through the imperial past – so it’s no wonder that the city’s historic centre has been named a UNESCO World Heritage site. Vienna is home to more than 27 castles and 163 palaces, and you can discover precious cultural artefacts on every corner or dream of the ‘good old days of the Empire’ in a coffee house. Fancy a bit of shopping that goes beyond the ordinary? Then make sure to visit one of the ‘K. & K. Hoflieferanten’, the imperial and royal purveyors to the court! 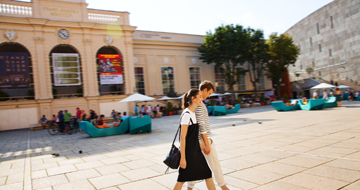 Whether you’re travelling by foot, tram or – quite traditionally – in a ‘Fiaker’, a horse-drawn carriage: a tour of Vienna’s Ringstraße (Ring Road) is a very special sightseeing experience, as this splendid boulevard is lined with numerous parks and buildings of note. When the Viennese go to the ‘Burg’, they mean the Burgtheater – the actual ‘Burg’, or castle, is next door. The Hofburg was the residence of the Hapsburg emperors for over 600 years. Today, this magnificent building houses important staterooms in addition to prestigious museums. But this wouldn’t be Vienna if there weren’t Fiaker waiting outside the doors of the president’s offices, or if the National Library wasn’t just home to contemporary works, but also one of the loveliest Baroque halls in the world. The Vienna Boys’ Choir sings in the Burgkapelle chapel on Sundays, and the Lipizzaner horses show off their skills in the Spanish Riding School. And, by the way, the equestrian arts on display at the Spanish Riding School have been recognised as an Intangible Cultural Heritage of Humanity by UNESCO since 2015. The Sisi Museum offers you an insight into the private life of Empress Elizabeth, who is likely Austria’s most famous monarch. 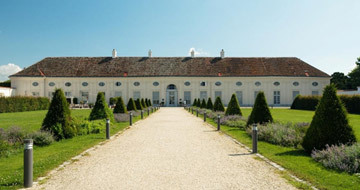 Just a couple of tram stops farther you’ll find Schloss Belvedere, the summer residence of Prince Eugene. The Belvedere houses the world’s largest collection of paintings by Gustav Klimt, including his famous ‘Kiss’. The general’s Baroque winter palace in Vienna’s first district also serves as an exhibition hall. 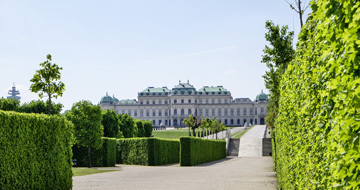 A visit to Vienna’s most famous palace also promises imperial artistic treasures. 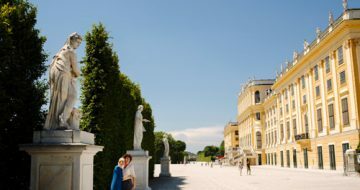 At Schönbrunn Palace, the imperial family had 1,441 rooms at their disposal – many of which you can still marvel at today. And architectural delights await you in the palace’s park, including the Palm House Garden and the Tiergarten, which has already been named the best zoo in Europe four times. 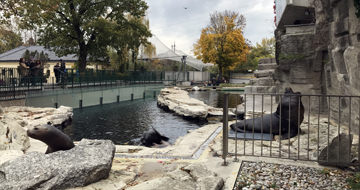 This comes as no surprise, because visitors today make their way through the former lion cages, while the animals themselves live in contemporary enclosures – and the Baroque style of the buildings has been retained thanks to a bit of skill and ‘Wiener Schmäh’ (Viennese charm). The world’s oldest zoo, which enjoys particular success in breeding elephants and panda bears, was built in 1752 by Archduchess Maria Theresa’s husband Francis I, Holy Roman Emperor. The pair were so close to one another that they still continue to share their final resting place today. 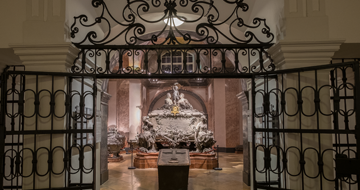 Their impressive double coffin is located in the Kapuzinergruft (Imperial Crypt), the tomb of the Hapsburg family. 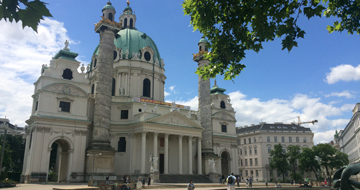 St. Stephen’s Cathedral is the religious focal point of Vienna and also, secretly, in its geographical centre. When the cathedral’s large bell, the Pummerin, rings at New Year’s, it’s even broadcast on television. The city also celebrates during the ball season, when crowds dance to waltzes all night long in the Redoutensaal at the Hofburg or one of the many palaces. And the Viennese pay homage to the good old days in their everyday lives, too – whenever they take a hearty bite of a Kaisersemmel (Emperor’s bread roll) or enjoy a Kaiserschmarrn (Emperor’s mess) sprinkled with icing sugar. Spanish Riding School: the only institution in the world that has continued to maintain the classic form, or ‘high school’ of the equestrian arts in the renaissance tradition for 450 years. The equestrian arts of the Spanish Riding School were named an Intangible Cultural Heritage of Humanity by UNESCO in December 2015.